It’s almost time!! My newest book, Quick-Fix Vegan will be officially available next week, so I thought I’d give you a little preview of what you can expect. The book contains 150 recipes that can be prepared in 30 minutes or less of active preparation time. To clarify, Quick-Fix Vegan is a totally different book from my previous book, Quick-Fix Vegetarian. I like to think of them as companion volumes. If you liked Quick-Fix Vegetarian, then you’ll love Quick-Fix Vegan. 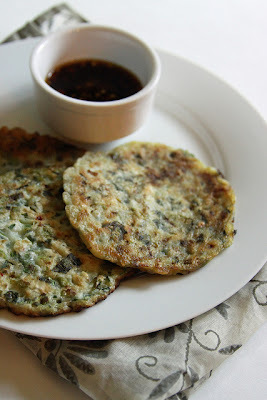 The photo above is a tester photo of the Asian Vegetable Pancakes (photo by Lori Maffei). Picture below is a tester photo of the BBQ Pinto-Portobello Sandwich (photo by Andrea Weaver). ....and lots more! Quick-Fix Vegan is available for pre-order on Amazon and will be available wherever books are sold on October 4. Please "Like" Quick-Fix Vegan on Amazon and help spread the word about this new book on your blog, Facebook, and Twitter. After you've had a chance to enjoy the book, I hope you'll also post a review on Amazon. Back in May I promised to share with you the recipe for this fabulous gluten-free pasta dish that our friend Francis Janes made for us when he and his family were visiting with us from Seattle. So here it is September and I’m finally getting to it. I didn’t mean to procrastinate, but life has been, let's just say, more hectic than usual these days. As you may know, Francis was chef/owner of Café Ambrosia in Seattle, so if you’ve never sampled his cooking, now’s your chance. Here’s his recipe — better late than never! Prepare the asparagus, mushrooms, artichokes, bell pepper, and green onion as suggested and set aside. Prepare pasta as per instructions and drain. Rinse with cold water to prevent from sticking. Transfer the pasta back into the pot and toss with the olive oil. Set aside. In a medium sauce pan, combine the vegetable broth and soy creamer and warm over medium heat. In a large sauté pan, melt the margarine over medium heat. With a whisk, incorporate the brown rice flour into the melted margarine until thoroughly combined. Ladle the warm broth into the sauté pan while constantly stirring with whisk. Add more broth or soy milk in small amounts if sauce is too thick. When the sauce is at desired creaminess, blend in the sea salt and nutritional yeast. Taste and adjust the seasonings, if needed. Add the reserved vegetables to the pasta. 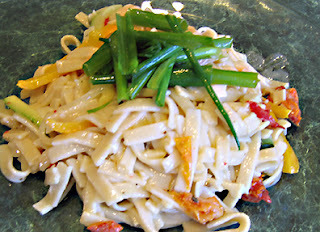 Pour in the white sauce and mix well, tossing gently to combine, and heating for a few minutes, if needed. Season with freshly ground black pepper. First, I grilled the hot dogs and then put them on a plate to cool. I made a small batch of impromptu chili by combining some TVP granules with ketchup, relish and chili powder. After heating the chili to bring out the flavor, I let it cool as well. 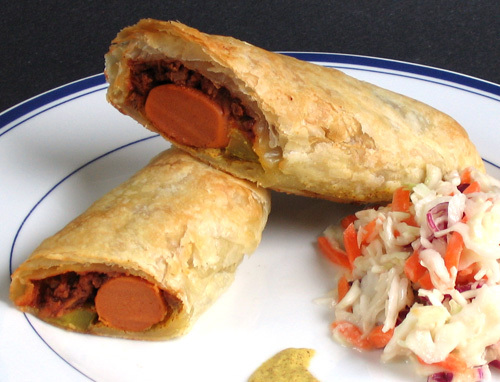 While the hot dogs and chili were cooling, a sheet of vegan puff pastry was thawing. To assemble, I cut the pastry into 4 equal pieces and rolled them out a little. I then spooned a line of the chili onto each piece of pastry, topped it with a hot dog, topped the hot dog with mustard, and nestled a thin strip of dill pickle next to the hot dog. The pastry was then wrapped around the hot dog and its toppings and baked until nicely browned. Served with coleslaw and some extra mustard, this made a very fun — if not exactly traditional — Labor Day meal. I can’t wait until next year — by then I will be using my own hot dog recipe! When I saw a pile of humungous seedless green grapes at the store last week, I said, "Wow, those are so big, you could stuff them!" So what else could I do but follow through on the idea to see how they'd turn out. I happened to have some leftover ground pistachios from the Baklava Palmiers (see previous post), so the base for my stuffing was obvious. Almost like destiny. As if fate had played a hand in making these stuffed grapes a reality. I wanted to add a little sweetness to the pistachios for the filling so I blended them with an ever-so-small amount of peach jam. I then hollowed out several grapes, and viola. 1. They're easier to make than I thought they'd be. 2. They taste even better than I thought they would. They taste so good in fact, that Jon and I were popping them in our mouths as fast as I could make them. Somehow, I managed to snap a quick pic of a few of them, just to show you how cute they are. 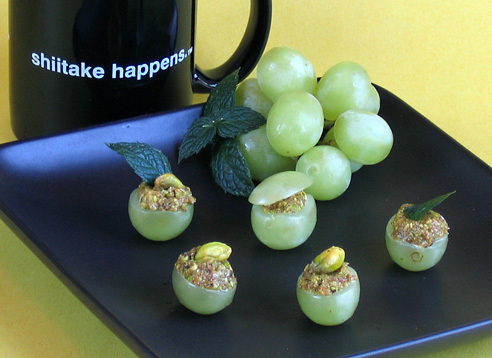 I garnished some with mint, others with a whole pistachios. Some had a little grape cap. Fun with grapes! Notice my "shiitake happens" mug in the background. I love that mug. I got it at the mushroom "museum" in Kennett Square, Pa.
More fun with grapes: You probably already do this with grapes, but for a quick and refreshing treat, remove seedless grapes from their stems, wash the grapes well, dry them, then freeze them for a refreshing frozen treat. So good!